As the 2017-2018 year closes we are delighted to announce the success of our fundraising campaign to create a 10-year scholarship in honour of Dr Charles Barder. With the generous support of our community we have reached our goal and created a sustainable fund which will support a series of High School scholars for the next decade. 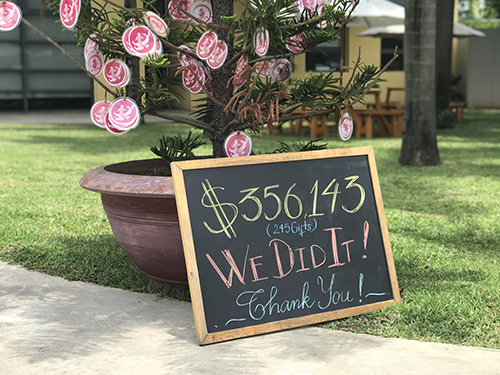 Our goal was to raise $350,000 USD and this week we surpassed that goal with $356,143 USD from 245 gifts, from families, faculty, staff and alumni. More than 40% of our community took part in creating this success through direct giving or participating in our FUNd Run! Next year we will recruit our first Dr Charles Barder Scholar to join our other scholars who are all supported through community giving in the last four years and through the school operating budget. We will be recruiting at least three new scholars next year to join us in Grades 8 and 9 for the 2019-2020 School year and we will be creating a taskforce to help us find the most deserving and talented future scholars. Look out for more information in the new year. Our scholars are extraordinary individuals and this year we celebrated the graduation of Linh Vu Nguyen who exemplifies the dreams that we had when we created the programme five years ago. Not only has Linh excelled academically and won a full scholarship to Vanderbilt University, she was also awarded the Dr Francis Rhodes Award in recognition of her outstanding commitment to the service of others. You can read her story in full in the new edition of UNiquely UNIS. The Scholarship Programme at UNIS Hanoi provides opportunities to transform lives and we thank you sincerely for helping us to make that possible. We cannot imagine a more suitable tribute to our longest serving Head of School and the legacy he leaves our community.